latest SMS from pirate ship: "Took 3h20 minutes to first shipping zone. Just had some tea and honey sarmie. Water temp 17 degrees. Still in good spirits. Water choppy. Crew freezing!" received SMS from pirate ship : "andy’s swim started at 4:21, northerly wind, chirpy at first feed, still very dark and currently a bit lumpy"
Received following picture taken 2 hours from start. And sport trac screen grab on right. Click to enlarge images. Swim confirmed for 03h30 start. Todays swimmers had rough water but a trailing sea, which should have helped times. 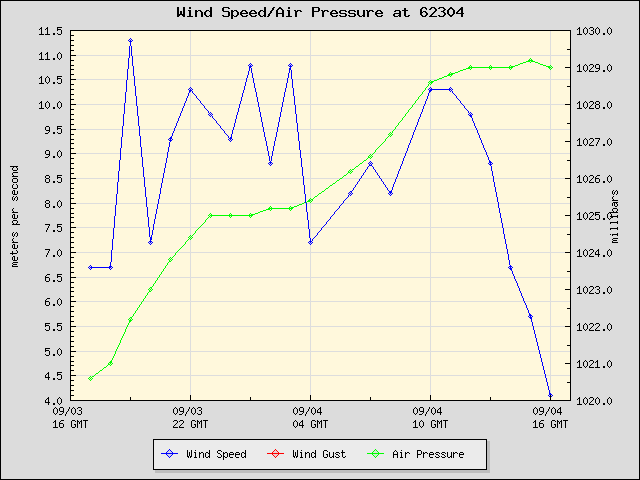 Wind still dropping - great - see chart below. Forcing down the last pasta, and waiting for my pilot Chris Osmond to confirm tomorrows’ 03h00 start. 03h00 tomorrow (Wednesday) provisionally confirmed for my swim. Weather & water have improved substantially and the high pressure system seems to be arriving slowly (http://www.meteonet.nl/aktueel/brackall.htm). The first swimmers this neap tide got away between 03h00 & 04h00 this morning. I got up to watch them, thinking that will begin the reset of my body clock for tomorrow’s start, and met an Irish swimmer John with the same idea. From the Varne Ridge lawn at the top of the Dover cliffs we watched the little convoy make it’s timid way into the channel, with the lead boat accompanying a relay swim & getting away from the others. Wind is now 20 mph SW & ugly sea - the same wind that pushed me halfway into the North Sea last year. The locals are all confident "looks good for Tuesday." Starting to get ratty now - logistics like accommodation & plane tickets start to intrude. Afternoon swim at Shakespeare beach; white cliffs of Dover in the background. After conferring with the crystal ball & my pirate it looks like a Monday 03h00 (UK) start - if the weather keeps to the plan. This has the benefit of getting away from the most extreme of the spring tides - which turn out to have been the most extreme of the year. The early start also suits me fine, as my alarm clock has been set at 04h30 for the last 18 months to get to training before work, and it also means that I can get a couple of miles under my belt before the sun rises i.e. helps break the monotony of the long day at the office. Also, if all goes well, it means that I can finish in daylight - instead of keeping everyone up all night hunting the French coastline like last year! Back to the pool & the pasta; gotta focus on the French champagne not the English beer - thanks Ryan! Meeting my pirate today to discuss battle plan with the weather. The wind is NW i.e. a favourable tail wind, but stronger than hoped for. The pirate believes that the current combination of wind & spring tide does not make for an easy swim, so it’s back to the local swimming pool to maintain condition. I hope that he is not gun-shy after last year’s episode, because if we are waiting for a perfect day then we’ll be here for the rest of the year. After a week in Dover the White Horse pub, where all the successful swimmers scribble their names on the walls & ceiling, is just down the road from the pool & becoming more alluring!